When a partnership is divinely guided, there is very little man – or this case, Erik Liedholm — can do to change the course of its destiny. It was 2001, and the sommelier was happily working at his job with the Hyatt in downtown Seattle, when Chef John Howie practically railroaded him into coming on board as Wine Director at a new property (Seastar Restaurant And Raw Bar) he was opening in Bellevue. Chef John Howie’s big determination wore down Erik’s confident protests, and a partnership was finally formed that lives on to this day as one of the most successful chef-sommelier pairings in the United States. But restaurants weren’t the only things the two were meant to do together. The formation of Wildwood Spirits — a boutique distillery that produces a winning collection of world-class spirits — was a triumphant collaboration that was next in the cards. Erik was dabbling with distilling at the time with a small still in his garage. It was a side hobby for the sommelier, but the art and science of the distillation process totally fascinated him. Fortuitously, it was also a time when Chef John and Erik were actively seeking out local spirits from craft distillers to see if they found something they liked well enough to bring into their restaurants. Major Start-Up Problems — And A Solution! Alas, they found they couldn’t do it! The law wouldn’t allow them. For some curious reason, Washington state laws at the time (they have changed since the state got out of the liquor business) prohibited restaurant owners from owning a distillery or winery as well. This came as a big blow to the partners’ exciting new plans to start a distillery, but surely there had to be a way to carry on with the project without actually breaking the law? There was. His name was Kris Berglund, a biochemist at the Michigan State University (MSU). Berglund (who unfortunately passed away last December) was working with some major distilleries to develop spirits at his facility, and Erik was convinced he was the man who was going to help them find the right products for Wildwood Spirits to build its reputation on. Erik had always been a huge fan of Negroni (a cocktail made with a London dry gin and campari) and the partners decided to produce a unique London dry gin as homage to this preference. 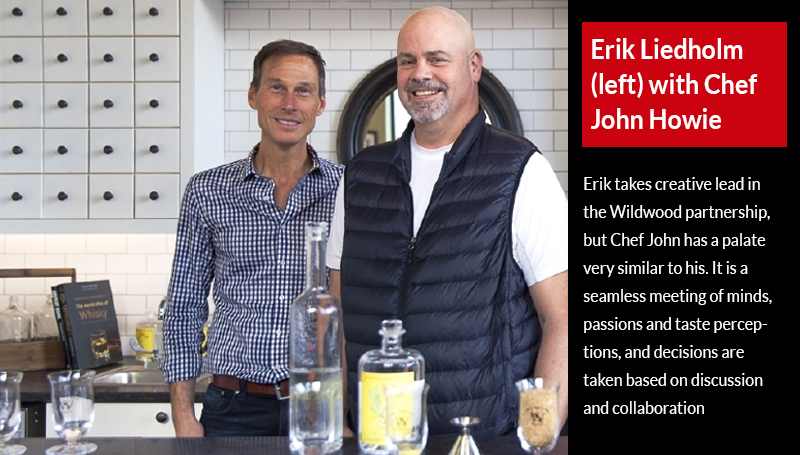 “I was fine with Erik’s palate and the way he tasted things, so I figured it would turn out great,” says Chef John. Erik decided he wanted to try fractional distilling, an artisanal and painstaking process that involves extracting and storing each botanical element separately to ensure a steady supply of seasonal ingredients throughout the year. Sourcing the right botanicals at their prime was after all the biggest challenge. Erik grew some of the local ingredients they needed like Braeburn apples in his own backyard, and had two Douglas fir trees that produced enough needles to make the gin’s essential essence. But they still needed things like Seville oranges and juniper, which don’t grow in WA, and had to be imported and preserved. No wonder, fractional distilling made so much sense! In spite of the time investment and production complications involved, this rarely-used procedure allowed Wildwood to keep its commitment to preserve peak seasonality in their botanicals. An attribute that makes the resulting product – Wildwood’s Kur Gin – stand out as a class of it’s own and win prestigious awards year after year. Then came the next spirit from Wildwood that creatively combined the chef ethos with a sommelier’s one: Stark Vatten Vodka(Swedish for `strong water’). Another winning product in other words, that – like the Kur Gin – is decorated with awards year after year. The world certainly seems to be in full agreement. Kur Gin has now won well over 10 different awards, both national and international. The spirit has received great recognition from magazines such as Wine & Spirits and Art Culinaire. It won the Double Gold Best In Show award at the New York World Wine & Spirits Competition, where Kur beat out every gin in the world in 2014. It was re-entered for the same competition in 2017 and it received another Double Gold. In 2017, Kur Gin also received the Washington Cup. 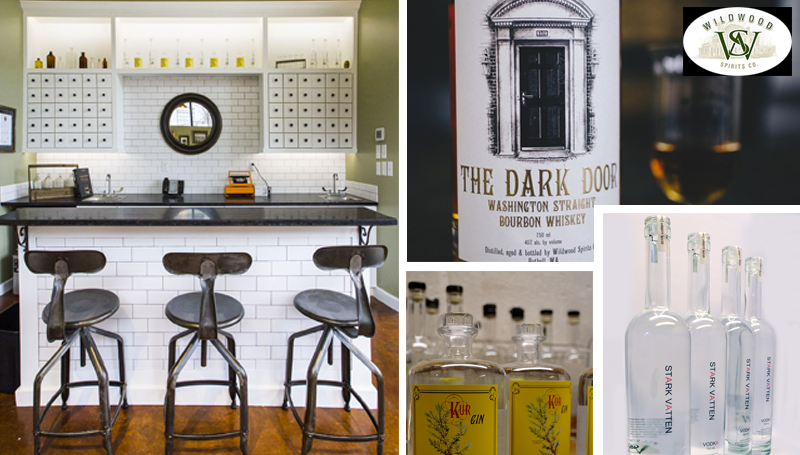 Stark Vatten vodka has won the Washington Cup as well, and now, Wildwood Spirits is getting started with their whiskey – a bourbon called Dark Door. From the very first barrel of bourbon that was brought out, one bottle was sent to Berlin for the International Spirit Competition and won Gold Medals – one for the bourbon itself and one for Wildwood as WA’s best distillery. Thereafter, a bottle of Dark Door was sent to the San Francisco International Spirits competition where it won Double Gold. “We believe we have become even better at making our bourbon since then, and we’ll enter it for a couple more competitions in the near future where we fully expect to be rewarded with great accolades,” says Chef John. A lot of people think of bourbon as an American product that is only made in Kentucky. But this is not true. When you make bourbon – or any whiskey really – it comes out clear in color like vodka. To darken it, the spirit is put in a charred barrel made of American oak. A second interesting fact about bourbon is that the barrels have to be virgin American oak barrels. They cannot be pre-used — and they cannot be re-used. Other spirits can be made in them afterwards but not a second batch of bourbon. To call bourbon a `straight bourbon’, the spirit has to stay in the barrel for a minimum of two years. If you pull it out earlier but follow all the other rules, you can still call it a bourbon. But not a straight bourbon. You can of course allow it to remain in the barrel longer than two years. The longer it stays in the barrel, the bourbon evaporates. They call this the Angel Share. As the bourbon concentrates, it intensifies the flavors as it continues to draw flavor from the barrel. Which proves how essential the quality of barrels is to the bourbon making process. “One of the things we are doing at Wildwood Spirits Co. is putting the bourbon barrels back to use by filling them with our Irish whiskey called Old 830. “Anybody who has even smelled the barrels as they are aging, are blown away by how great the Irish is already turning out. We’re very pleased with that,” says Chef John. Erik Liedholm takes creative lead in the Wildwood partnership, but Chef John has a palate very similar to his. It is a seamless meeting of minds, passions and taste perceptions, and decisions are taken based on discussion and collaboration. Shop Online For Kur Gin, Stark Vatten Vodka And Dark Door Bourbon By Clicking HERE. Or call Wildwood Spirits at 425-826-1102 for a tasting.